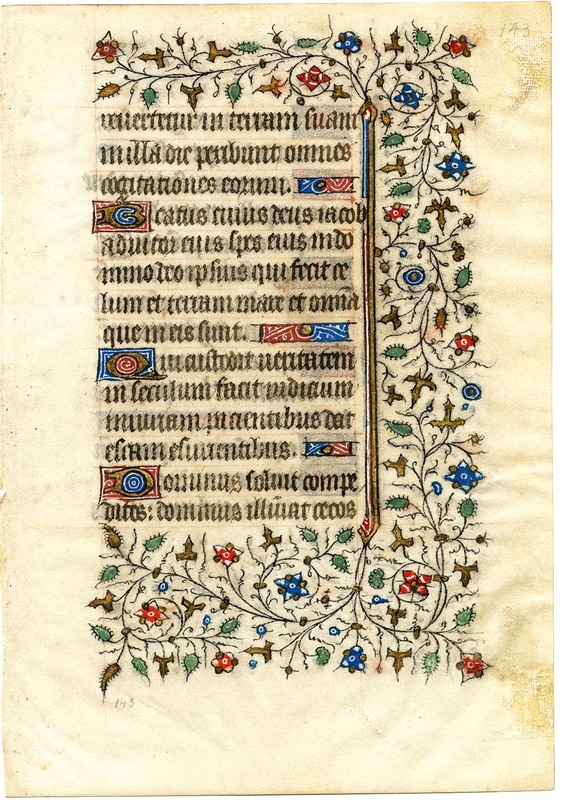 This leaf comes from a French Book of Hours made in the middle of the fifteenth century. It measures 38.5 x 28 cm. The text block on both the recto and verso is bordered by a thick hedge of gilded holly and ivy, as well as flowers which Ege identifies as daisy, thistle, cornbottle, and stock. The black ink used for the main text has become less substantial over time, and there is a relative lack of rubrication of response abbreviations. 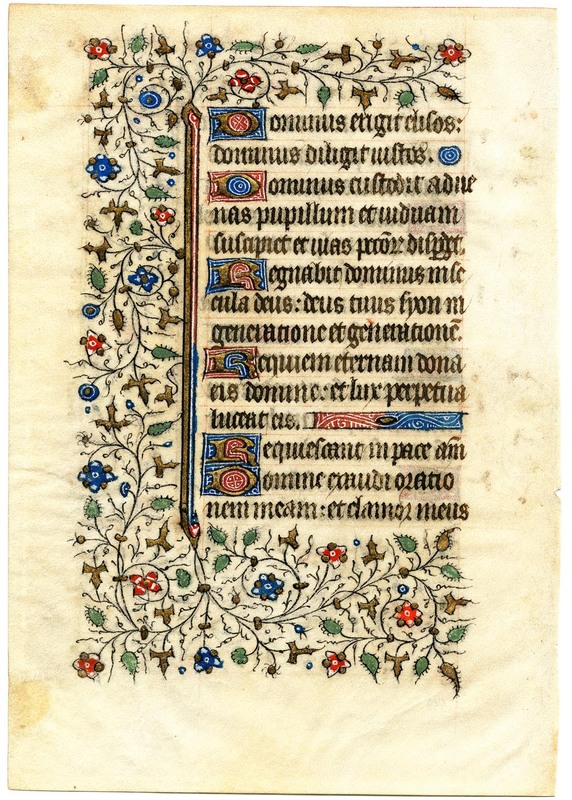 Text: This leaf contains text from the Office for the Dead at Vespers, mostly from Psalms 145.
revertetur in terram suam in illa die peribunt omnes cogitationes eorum. Beatus cuius Deus Iacob adiutor eius, spes eius in Domino Deo ipsius: qui fecit caelum et terram, mare et omnia quae in eis sunt. Qui custodit veritatem in saeculum, facit iudicium iniuriam patientibus: dat escam esurientibus. Dominus solvit conpeditos: Dominus illuminat caecos. [from Psalm 145] ...and he shall return into his earth: in that day all their thoughts shall perish. Blessed is he whose God of Jacob is his helper his hope in our Lord his God: which made heaven and earth, the sea, and all things that are in them. Which keepeth truth forever, doth judgement for them that suffer wrong, giveth food to the hungry. Our Lord looseth the fettered: our Lord lighteneth the blind. Dominus erigit elisos: Dominus diligit iustos. Dominus custodit advenas, pupillum et viduam suscipiet: et vias peccatorum disperdet. Regnabit Dominus in saecula, Deus tuus Sion: in generatione et generationem. [continuing Psalm 145] Our Lord lifteth up the bruised: our Lord loveth the just. Our Lord keepeth strangers, the fatherless and widow he will receive: and the ways of sinners he shall destroy. Our Lord shall reign forever, thy God O Sion: in generation and generation. Eternal rest give unto them O Lord: and let perpetual light shine unto them. Let them rest in peace. Amen.